City Pages has a fun article and slide show on the pumpkin carving of children’s book author and illustrator David LaRochelle. See more amazing pumpkins on David’s own website. 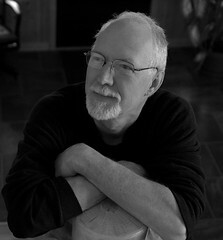 David is the co-author of Minnesota’s Hidden Alphabet, a new MHS Press book for kids featuring lush nature photography by Joe Rossi. Master storyteller Kevin Kling shares his memory of trick-or-treating as a nun, a costume he notes was ”the most frightening thing I [could] think of.” Read the excerpt from Kevin Kling’s Holiday Inn or listen to it online (Bloody Hell 2, at 19:00 minutes). Check out what Kevin is reading now on the MinnPost Book Club Club page, and visit his website for more information on his upcoming performance at the Fitzgerald Theater, November 26-27. The weekend is coming. Be inspired! Gather leaves, listen to poetry, bake bread! 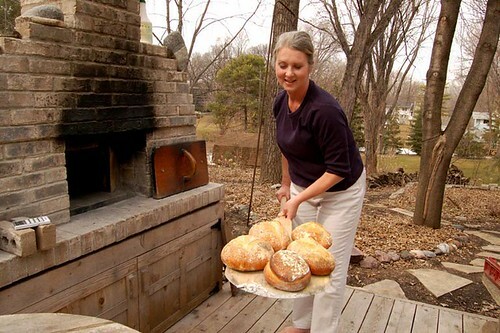 Journalist and baker Kim Ode, author of Baking With the St. Paul Bread Club: Recipes, Tips, and Stories, teaches the art of baking in helpful, novice-friendly videos on the “Baking Central” website at the Minneapolis/St. Paul Star Tribune. This week’s video: the art of focaccia. Stewart Woodman, author of Shefzilla, conducted this fascinating interview with MHS Press editor extraordinaire Shannon Pennefeather, who, by the way, has edited out the errors I made in this very post. 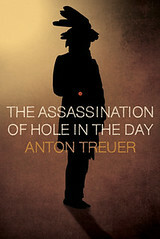 The Assassination of Hole in the Day by Anton Treuer explores the murder of the controversial Ojibwe chief who led his people through the first difficult years of dispossession by white invaders–and created a new kind of leadership for the Ojibwe. Anton Treuer is a professor of Ojibwe at Bemidji State University and the author of Ojibwe in Minnesota and Living Our Language, both published by MHS Press. 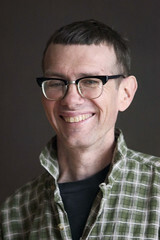 He is also a contributor to the forthcoming Ojibwe language children’s book Awesiinyensag, published by Birchbark House. A documentary titled First Speakers: Restoring the Ojibwe Language that features Professor Treuer’s work will air on November 1 at 8 PM on Twin Cities Public Television (TPT). Professor Treuer will talk about Hole in the Day on Tuesday, October 26, at 7:00 PM at the Minnesota History Lounge. For a list of events around the state with Anton Treuer, please visit our calendar and type in “Treuer” as a keyword. 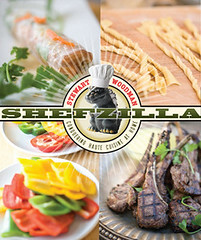 Stewart Woodman, aka Shefzilla, will be signing copies of his new cookbook, Shefzilla: Conquering Haute Cuisine at Home, this Saturday at the Mill City Farmers Market and Sunday at the Kingfield Farmers Market. Woodman’s restaurant, Heidi’s, was gutted by a fire last February in southwest Minneapolis. That morning, Woodman learned he was named a semifinalist for Best Chef: Midwest by the prestigious James Beard Foundation. Heidi’s was named one of the “50 Best New Restuarants in the U.S.” by Travel & Leisure Magazine and Best Restaurant in Minneapolis by City Pages. Undaunted by the fire, Woodman turned his time and energy to cooking on a smaller scale–at home, for family and friends. He learned to adjust his tools and ingredients, and the result is chef-quality fare suitable for the home kitchen. Woodman shares his decades of cooking knowledge in meal-sized bites in Shefzilla: Conquering Haute Cuisine at Home. For an inside look at Shefzilla, check out Rick Nelson’s Q & A with Woodman in the Star Tribune, The Heavy Table’s week of cooking from the cookbook, A Closer Look at Flyover Land’s review, Dara Moskowitz-Grumdahl’s review on Minnesota Monthly, and Woodman demonstrating how to make lettuce soup on Twin Cities Live and talking up the new restaurant with Angela Davis on WCCO (key in “Woodman” to play video). Minnesota has a wealth of comic book and graphic novel artists, editorial cartoonists, comic strip artists, minicomic cartoonists, and webcomics artists. 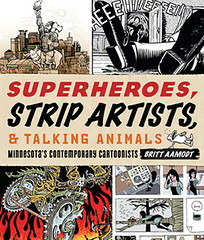 Many of them are featured in Britt Aamott’s new book, Superheroes, Strip Artists, & Talking Animals: Minnesota’s Contemporary Cartoonists. Hot off the press, the book will be available at two super events this Saturday: the Twin Cities Book Festival and FallCon. Britt Aamott will moderate a panel on Minnesota Comics at the TC Book Festival at 1:30. 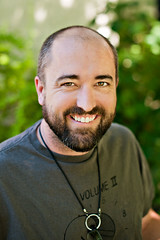 Will Dinski is one of the artists on the panel, and his artwork is included in Superheroes. The International Cartoonist Conspiracy will have an exhibit booth at the festival, with artist Danno Klonowski, also featured in the book, as host. Copies of Superheroes will be available for purchase at the Minnesota Historical Society Press booth or Magers & Quinn at TC Book Fest. FallCon, hosted by the Midwest Comic Book Association on the Minnesota State Fairgrounds, is this Saturday as well. More talent featured in Superheros will be at the show, including Zander Cannon, Dan Jurgens, Ryan Kelly, Bob Lipski & Brian Bastian, Gordon Purcell, Brittney Sabo, Barbara Schulz and Steven Stwalley. Check out this fabulous video by filmmaker Joanna Kohler that shares its name with the book and features interviews and art by Zander and Kevin Cannon. 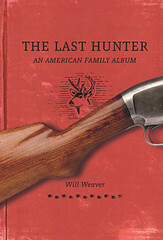 Will Weaver’s newest book, The Last Hunter: An American Family Album, is an examination of family, life on the land, and those things we hold dear enough to want to carry along, one generation to another. Here he takes the time to answer some questions about themes in the book. This week, Will will be reading and signing at bookstores and libraries in the Twin Cities area. See listings below. 1. You usually write fiction. Why or how did you decide to write about you and your family? Most of my fiction draws on real-life events, so writing closely about family was not a stretch. The Sweet Land story collection, Red Earth, White Earth, and even Barns of Minnesota are much about family. 2. As a young man, you were eager to leave small-town life, yet you returned later in life: why? When did you realize you wanted to return “home”? The American writer Thomas Wolfe wrote, “You can never go home again.” By that he meant, once you leave home and experience the larger world, things change forever. I now take comfort in the landscape of my youth (the fields, lakes, and forests) because the “City” (Minneapolis, New York, Los Angeles) continually beckons. And as a writer, when the City calls, I have to go. 3. Can you talk a little about the tradition of hunting in your family? Hunting was not a part of my mother’s family life, but it was central to my father’s family. As a young man, there was no question I would become a hunter, and it was an important part of my growing up. I still hunt, but far less, and more thoughtfully. 4. How does hunting connect you to the land? This is the part that cannot be fully explained. It has something to do with slowing the mind, slowing one’s thoughts, slowing one’s life. That is the effect I experience of being in the woods for periods of time. As well, hunting for me is a process of joining nature. Of truly understanding and appreciating it. 5. Your son and daughter are not hunters. How did you and your father respond to this? The Last Hunter is much about these sorts of family dramas—the continuance (or not) of important family traditions. In my family it was bittersweet, but with moments of great humor, too. 6. Do you notice a decline in the number of young people hunting? If so, why do you think that is? There’s no doubt: fewer young people hunt, and there are several reasons. Hunting used to be seamlessly integrated into farm life, but only one percent of Americans now live on working farms. As well, young people today are far more “distracted”–have more demands on their attention than any generation before. Modern technologies of cell phones, the Internet, etc., are a constant presence. But it is also good to “unplug.” Hunting or just being in nature is a good antidote to the constant noise of modern culture. 7. With fewer people hunting, who do you think is the audience for your book? A memoir necessarily has to be about the author, but it also has to connect with other peoples’ lives. As soon as the book came out I began to hear from readers with the “same story”—of how hunting used to be a part of their lives, but now was in transition. For an author, it’s wonderful to hear those stories. In the end, it’s a book for the thoughtful hunter or nature lover, and for the general reader who likes a good (and well-written) family story no matter what the subject matter. Wednesday October 13 at 7:30 p.m.
Thursday October 14 at 7:00 p.m.
Friday October 15 at 6:00 p.m.
Saturday October 16 from 3:30 to 5:00 p.m.
On one of the warmest of fall days in the Twin Cities, we all know what we can look forward to: within just a few weeks or months, we may see that childhood delight, a snow day. 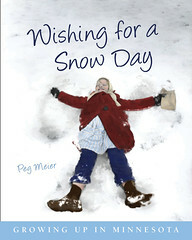 This lovely book by the celebrated and beloved Peg Meier, just out from the MHS Press, will remind you of–and surprise you with–many other pleasures and trials of childhood. Funny: they don’t change that much over the decades. Here’s a sample, full of delicious stories about birthdays.